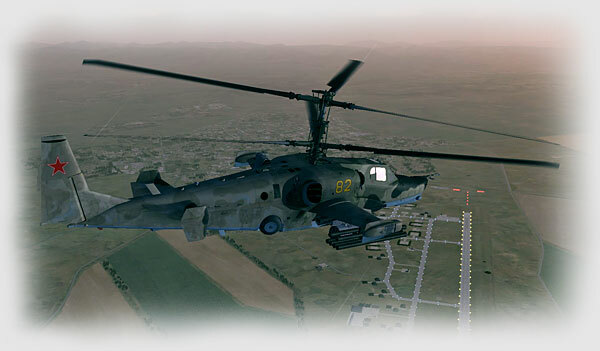 Today we are going to take a brief introductory flight in the DCS: Black Shark Ka-50. 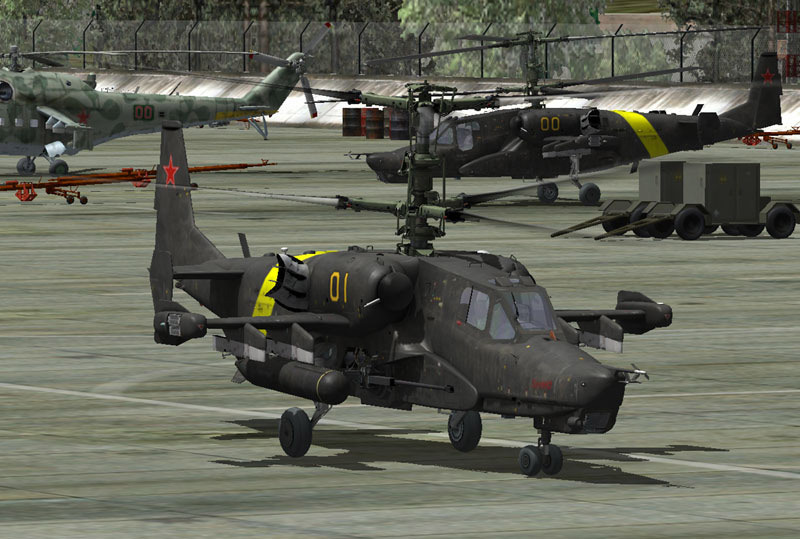 Known more widely to us Westerners as the “Hokum-A”, the Ka-50 is a single-seat attack helicopter conceived by the Kamov Design Bureau and brought into production over the span of three decades. I’ll spare you the lengthy history of its development, but the end result is an impressive and capable aircraft that has recently begun to see action in troubled regions throughout central Asia. I’ve been on the DCS: Black Shark beta team for exactly one year and I’ve quietly watched the progress of this simulation as it’s progressed through the development cycle, but it wasn’t until a couple weeks ago that I actually started flying the most recent beta release. I’ve watched the stunning videos that have been released — both the flashy, pulse-pounding action videos and the more demonstrative producer’s notes videos. They are incredible and give a clear indication of the depth and commitment to realism that the DCS line seeks to accomplish. In preparing this article I’ve spent the past week just starting to understand how to fly the Ka-50 and I feel like a kid in a candy store. 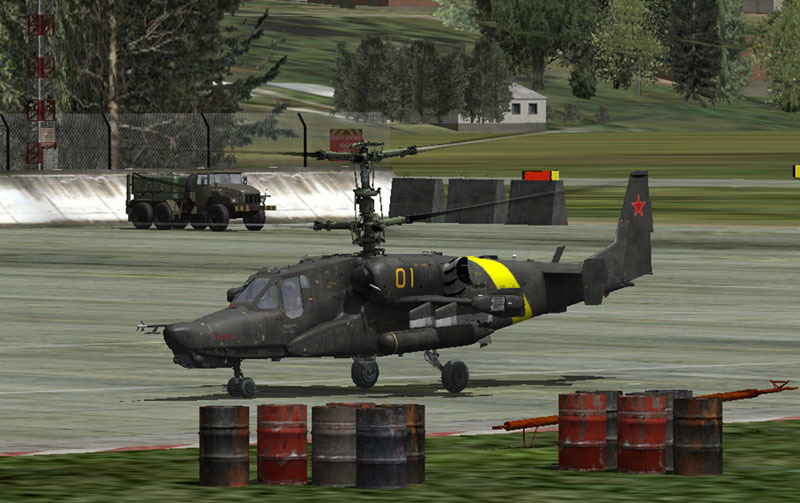 This series of articles will be a faithful accounting of my development as I learn how to fly and fight the Ka-50. The articles won’t be exhaustive since I’d like to tackle more in-depth learning after Black Shark is released. So let’s take a crack at this first flight! For our “familiarization flight” we are going to skip the detailed pre-flight and manual engine startup procedures. Frankly, I haven’t yet learned all of the steps required to go from a cold & dark cockpit to ready-to-fly status; like I said, we are going to be learning together here. So we are sitting on the ramp at Sochi-Adler airfield with our engines idling and all of our systems are up and running. I know you won’t believe it, but in the 30+ hours I’ve been experimenting with the Black Shark beta this past couple weeks I haven’t even armed or fired a single weapon! That is what is going to be so incredibly awesome about this sim — the level of avionics and systems fidelity (at least on “realistic” settings) will require many hours of practice and study to begin to understand how they work. The ABRIS (Advanced Moving Map System) alone will occupy many hours of reading the manual and pushing buttons and twisting knobs. All of those things — avionics and radios, warning systems, annunciators, and systems functionality — will be covered in subsequent articles. For now we just want a basic introduction to flying this machine. With clear skies and just a light breeze blowing across the field, I settle in behind my HOTAS and get ready to take flight. Gently wagging my stick (cyclic) back and forth tilts the rotor system forward and backwards and side to side. Immediately you can sense the flight dynamics of this sim are going to equal or surpass the phenomenal modeling of the Su-25T in Flaming Cliffs. 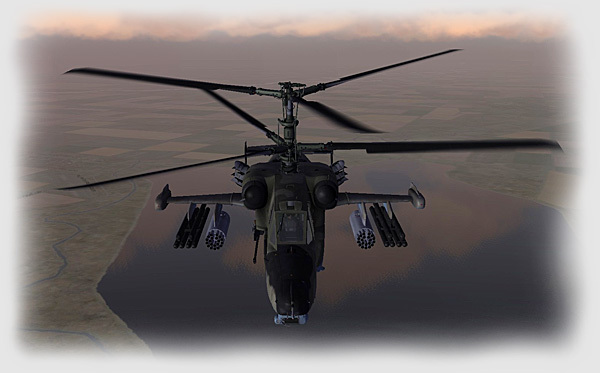 As the rotor system tilts you can feel the airframe lean and the wheel struts extend and compress in a realistic fashion, mirroring the loading on each individual assembly. Pull in a little power (collective) and the helicopter gets light on its wheels and the tandem blades start slapping the air. Ground taxiing can be accomplished by pulling in a little bit of power and controlling rolling “thrust” by tilting the rotor system forward or backward with the cyclic. 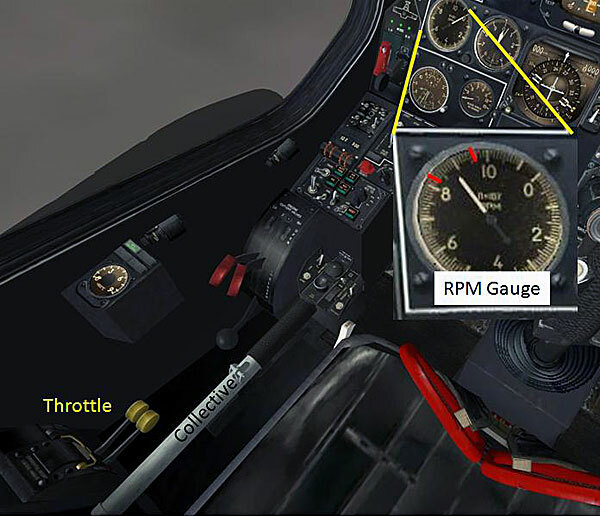 Steering is accomplished with controllable nose wheel steering via the rudder pedals. Rolling taxiing has many advantages to hover/air-taxiing in that it requires far less power, burns less fuel, and risks less damage to nearby equipment by reducing the amount of rotor wash coming off the rotor system. Once we reach a clear area of the apron we come to a halt and start pulling in more power to enter into a stable hover. I use the word “stable” somewhat liberally since my hover is often a bit of a comedy of control inputs that sometimes results in my helicopter staying somewhat near my intended hovering point. If you didn’t already have a sense for the flight modeling fidelity during the taxi, you will nowdefinitely be floored by the fantastic feeling of flight that Black Shark imparts. 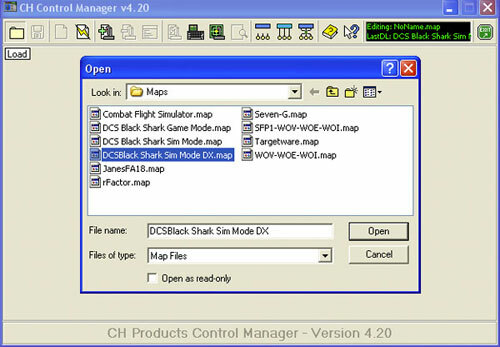 The “dynamic” part of Eagle Dynamics is appropriate to this software. 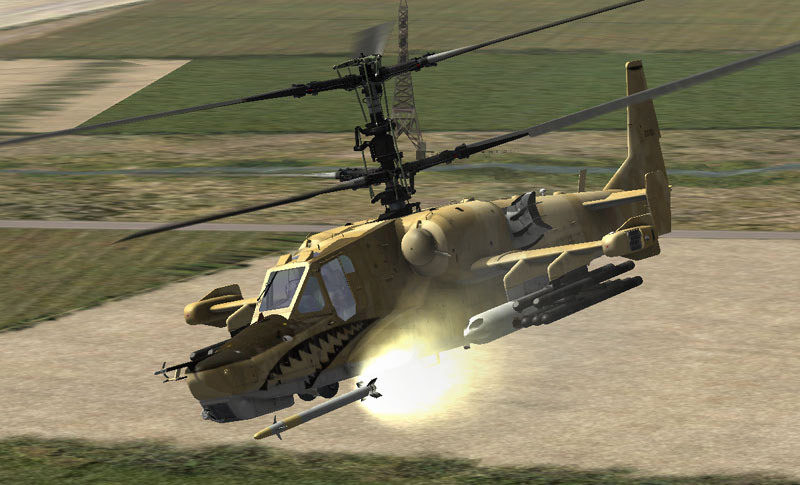 As you can see in the video that accompanies this article, the task of hovering the Ka-50 in Black Shark is a constant affair of making very tiny control corrections in concert with many other inputs. 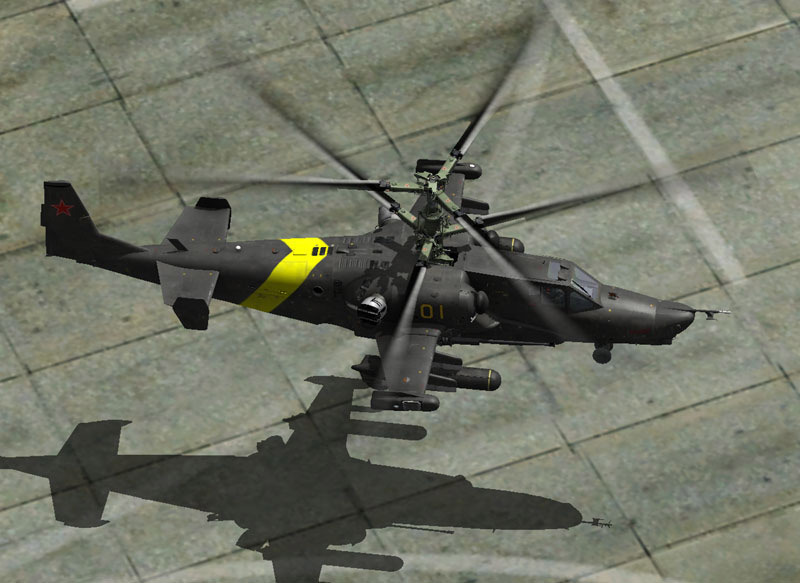 Though the Ka-50 has counter-rotating rotor blades that cancel out torque (explaining the lack of the anti-torque tail rotor that most conventional helicopters have), there are still weathervaning effects and other subtle turning forces imparted by the dual rotor system that still require constant attention. 3-D position keeping requires constant adjustments of pitch, roll, yaw, and power and you quickly realize that just flying this aircraft is going to be an exciting endeavor alone. Throw in managing systems, weapons, and enemy threats and I see some interesting nights in front of my computer coming up. I’ve never flown a helicopter flight simulator with a feeling of flight as authentic as Black Shark (keeping in mind that I’m a mere fixed wing pilot in real life — because we all know “rotorheads” are slightly insane). Hover taxiing up and down the ramp and around the airfield is good practice in developing good flying skills. My skills still need a LOT of work, but after an hour or so I can feel that old familiar ache developing in my shoulders as my muscles have remained tense on my HOTAS. The only other two sims that I recall getting that feeling with are Longbow 2 and EECH. 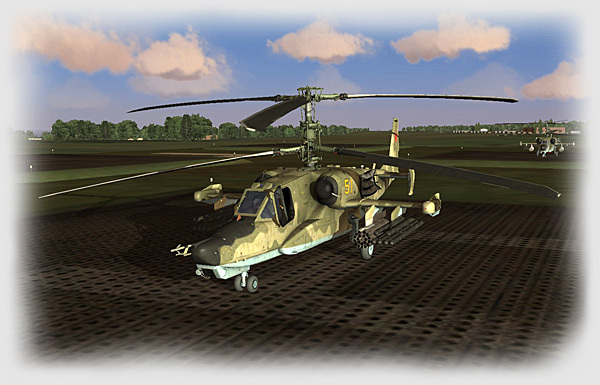 Neither of those sims compares however, with the dynamic feeling of flight the Ka-50 imparts. You’ll have to fly it to believe it, but it really is incredible. Which brings me to why I’m so excited about the prospects for Black Shark: too often our flight sims are primarily an exercise in weapons employment. The core of this sim, I believe, is that the flying is fantastic and that mastery of that will be a prerequisite for all of the strafing, missiles, and bombing that will follow. I’ve spent hours hovering around the ramp, maneuvering around objects and trying to fine tune my flying technique. Over the many hours I’ve done this I’ve crashed a few times, rolled over after accidentally catching a tire during a sideslip, fractured rotor blades on light poles and endured jarring vibrations from the remains of the splintered rotor blades. I’ve gotten caught in vortex ring state (settling with power), gotten low rotor RPM warnings, over-torqued the engines, pedal turned into ground vehicles and sheared off many parts of my aircraft. The damage modeling is simply unbelievable — we’ll get to that in a future article. Inattention or distraction when flying helicopters can be unforgiving, it is the nature of low altitude, high threat environments. There is a certain satisfaction though to coming in for a landing, zeroing out your velocity and slip and gently settling to the ground as you slowly transfer the weight of your aircraft from the rotor system to the struts and then to the wheels. There is, of course, an extensive shutdown and securing procedure that we’ll skip here and look at in future articles. 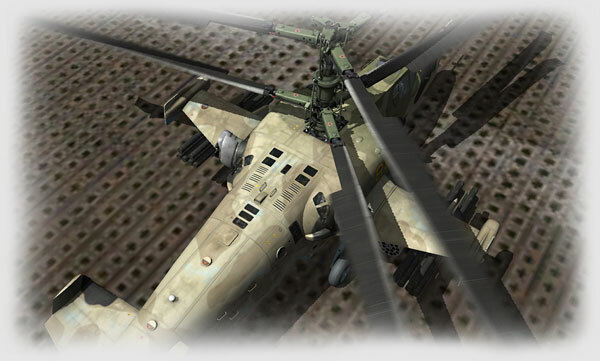 There are options to connect ground power if a ground power unit is available and communications menus to request fuel and weapons reloading. If you just want to fiddle with the ABRIS or learn to use the avionics you can fire up the APU (auxiliary power unit) to provide electrical power while you experiment. 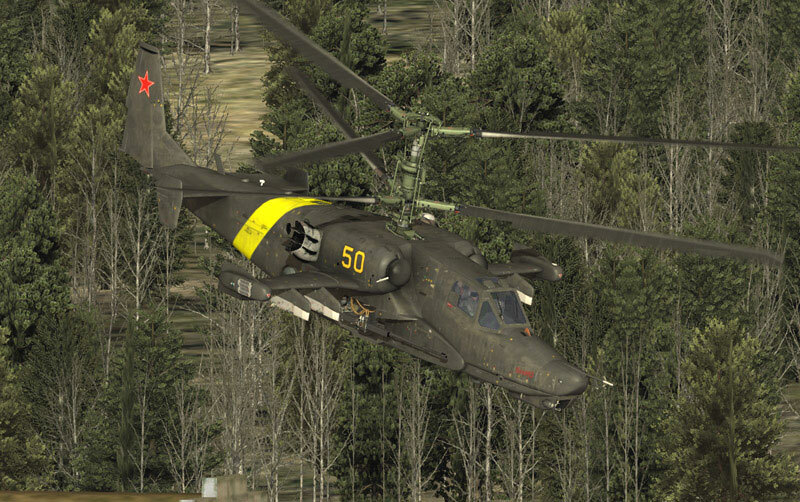 I’m really looking forward to exploring the ABRIS, flight planning, and learning all of the capabilities of the navigation and data-link suites installed in the Ka-50. Yes, I’m excited to blow things up too, but as a professional pilot in real life I find myself drawn to the complexities of the systems and avionics. I know what it is like to learn a new airplane and the Ka-50 is my new study partner. Here is a zipped wmv video I created for this Preview. The download is 16.8MB. 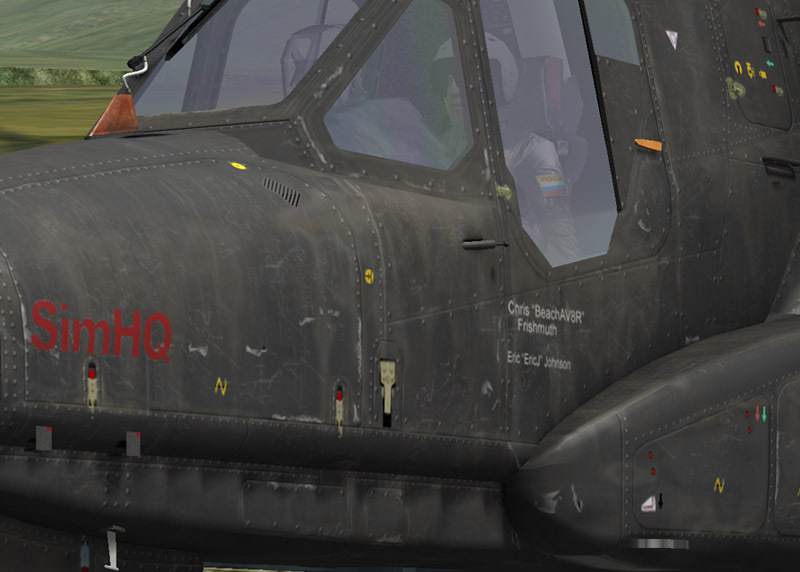 Many thanks to Eric “EricJ” Johnson for providing me with the custom Ka-50 training skin for my articles. His creativity and artistic talents are phenomenal.